Physicists have produced the first-ever blueprints for a large-scale quantum computer that could herald a technological revolution in computing. If the industrial blueprint works, it could see the first super-fast quantum machine being built within a decade at a cost of tens of millions of pounds. Quantum computers have long been seen as the next stage in computing technology. Scientists believe this next generation machine could be many millions of times faster than contemporary computers. An international team the University of Sussex published the new blueprint in the academic journal Science Advances. “For many years, people said that it was completely impossible to construct an actual quantum computer. With our work we have not only shown that it can be done but now we are delivering a nuts and bolts construction plan to build an actual large-scale machine,” lead scientist Winfried Hensinger said in a statement. The revolutionary potential of quantum computers lies in their ability to work at the atomic level, where an atom can mysteriously exist in two different places at the same time. This means a qubit – the quantum version of a traditional ‘bit’ of computer information – can be both 1 and 0 at the same time. At the moment, a ‘bit’ can only be 1 or 0. Scientists believe a computer system that operates on this level can perform many more multiple calculations at one time. 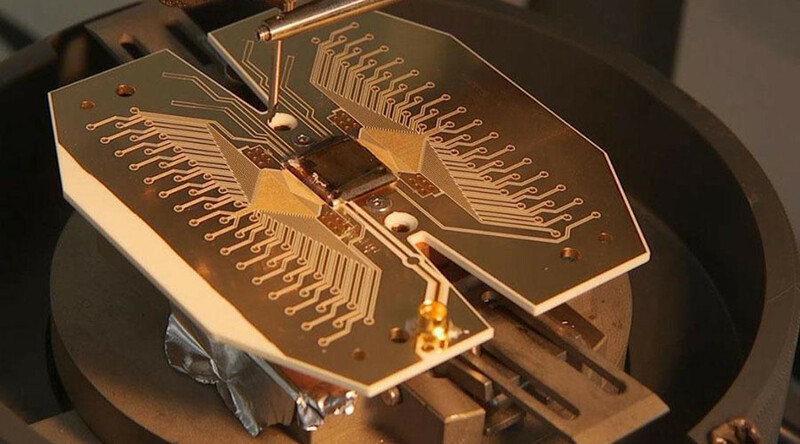 Previous attempts at building a quantum machine have been limited to a computing capability of 10 or 15 qubits, but now physicists claim to have come up with a way around this restriction. Whereas scientists had previously used fibre optic connections to connect individual computer modules, the new invention uses electric fields to push ions from one module to another. “A modular design is absolutely critical in order to realize a quantum computer with truly phenomenal processing power,” Hensinger told the BBC. The new machine is not going to be cheap, however, with a starting cost of £1-2 million ($1.25-2.5 million), which could balloon to tens of millions. But the cost could be worth it once the new supercomputers get to work solving society’s most difficult and complex problems. “The availability of a universal quantum computer may have a fundamental impact on society as a whole,” Hensinger said in a statement.